Not every workout should be about how hard you push it, but rather more about if you’re doing it right. Work smarter, not harder. 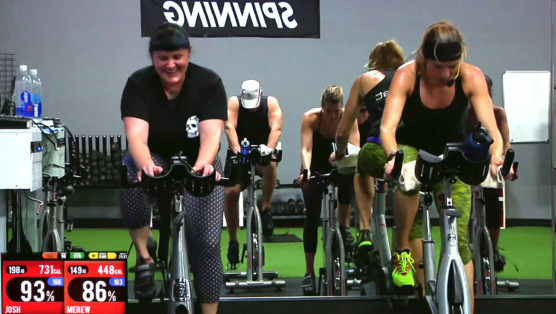 In this online Spin class that focuses on heart rate zones (which translates to intensity level), Cat guides you through seven back to back 6 minute drills specifically aimed at teaching you how to control your heart rate and intensity levels while you ride. You do not need a heart rate sensor to benefit from this ride, but if you have one, do wear it. 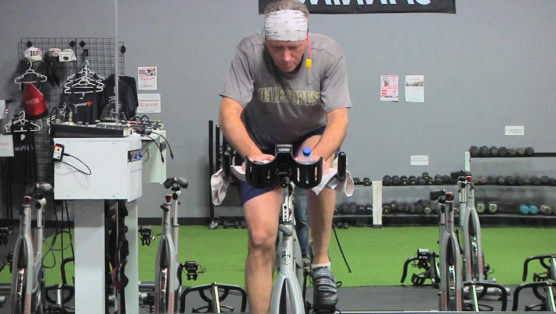 And, remember that the goal of this Zone Ride Cycle class is accuracy and control. Let’s ride. I love the Zones. Cat can you get all the trainers to do their version of the Zone ride. MM2019 week four. This class is amazing as always cat! MM2019. Great class! Energized me on this lazy Sunday morning! Loved the bonus sculpt too!! MM2019 SUPER SWEATY. Great class. I was going to do a light ride today. Who was I kidding with Cat Com! Ha 😉 It’s never what we expect it to be..
MM 2019. Every single color of the rainbow represented here. Great ride. Love this wo. Engages both my body and mind. I do it weekly. MM2019 so glad I didn’t fall off the bike! I even hung in for the sculpting, although a bit shakey! Never said it’d be easy Jaclyn!! My favorite type of fest! This zone ride was perfect Cat as my first workout back after being sick for a week-it allowed me to explore my zones and gauge my cardio output-thank you! I just love your Zone Rides! And I love those leggings, too. Wow!!! I’m a sweaty hot mess!!!! Feels GREAT!!! Such a different kind of class & surprisingly still super challenging!!! Thanks Cat! I enjoyed this spin class so much! Time just flew by, I was completely soaked in sweat. Liked the sculpting session too, nice bonus. Great Cat ride! Thank you. Of course Carla! Have a great weekend. Push to Silver–Olympic Challenge! That was fun! Great music, Cat. Push to gold next time Darlene 😉 Thanks! Olympic Challenge – Class 13. Let me know if you’re still dealing with issues. Fabulous class Cat! You need a Superhero Cape! Ha! What’s my superpower Whitney? First class studio sweat class…. looking forward to more Cat. Wow loved this class. If was tough but fun. Love the music and your chat as always Cat! Just finished my weekly zone ride and it was awesome again! Its 27 below zero here in Wisconsin, with a wind chill of 57 below. I hit the red zone a little too often today but the sweating felt great. Love this ride. Thanks Cat. Dang, that’s cold! Glad you’re staying warm Linda! As a super Type A personality, I love this class. It helps me build my heart rate slowly to max. Otherwise I tend to over do it in the first 15 minutes and then hit the wall. Why do you say to only do once a week? Hi Barbara. I meant I would only want to do this particular ride about once a week because I am also the type that likes massive variety. If you love it, you do it as much as you’d like. Go girl! Too kind – let’s see how many times it takes for you to get sick of it!! I have done ✅ this workout 🏋🏽‍♀️ three times (with myZone belt) and let me tell you IT ROCKS!! Great ride!!! Much needed for a Sunday morning after a long week! Thanks Cat! Glad someone can follow along <3 Thanks for riding with me Karen. I love the control and focus required with this one! Mental challenge! Love! Right!? It’s as much mental as it is physical. NYOC. Not as tough as typical Cat classes. Great workout! I’m drenched and learned so much! Loved the added sculpt! No one ever drowned in sweat ya know 😉 Glad you did Melissa! Nice workout – so happy with SSoD! Selection of classes is awesome. I LOVE this class. Im not sure exactly what it is but these types of classes are my favorite and typically the ones I walk away from feeling proud and accomplished. Having that specific HR goal each block and knowing the goal is to get it to climb somehow allows me to mentally be tougher I think. Thank you for an amazing class! That’s awesome to hear Tiff! Always strive for something & come into every class with an objective. I especially like the protracted, formal w/up & cool down. Happy you did Nicole! They were much needed!! NYOC 2019. So good! Just what I needed today. MyZone was actin .up a bit, so I’ll have to give it another go sometime soon! Hopefully you won’t run into any other issues with it! Great class!! I agree with everyone else – MORE!! I am LOVING ❤️ this workout!! It’s 10:45 at night and so glad I made myself come down to try this workout, one of the best I’ve done. Never felt so good to stretch at the end of it all. The class was tough but the time flew by, this ones definitely marked as one of my favorites. Thanks Cat! NICE Aida! That’s awesome news! Love the spin/sculpt format, really ups the game. Thank you. Thank you for another awesome workout! I know caloric burn is not a reliable indicator (too likely to have error no matter the measuring device), but this class pushed the top end for me and I’ve been spinning with SSoD for a few years now. This was a totally different approach for spin class. It made me think, “Am I going to be able to keep this up?” Always a good sign. Thanks. Right!? I’m sure you kept up & KILLED it! Loved this! After a crazy house four days it is great to be able to focus! My first sculpt session and the dogs helped out!! Wow!! Loved this zone ride and the sculpt was an extra special ending!! What a great class to make you aware of different working zones and breathing control, loved it! All about control girl. Glad you got something out of it Helen! My Zone is seeing red! Added to my favorites! Yes!! Get out of that comfort zone 😉 & honored! NYOC2019-BSP..Woowzaa..Awesome spin/sculpt Cat. Thank you very much. Thanks for a great workout Cat! It’s been a while since I’ve a done a full hour class, and it felt fantastic! Loved the sculpt at the end! Yes! Always have to stay in control! I liked this rather different class, not much of classic spin drills, not even Cat’s classic ones😉; pleasantly surprised for sure, and the sculpt in the end was a nice final touch! Love that you did Paola! ANYOC 2019 Cat this class was awesome! It flew by and I have the goopy mouth stuff Too! Excellent ride. Proves you don’t always have to be in the red zone to burn a lot calories and of course get a good workout. Thanks Cat. Love, love the heart rate cues. I’m still working on my speed, so when the cadence is 100 and I’m not quite there, it’s nice to know where my heart rate should be to keep things even. Olympic Challenge – Class 4. This is a great class Cat – I’ve been doing a lot of ‘zone rides’ myself so this was a great addition for me 🚴‍♂️👍😅 – can see me doing this over and over again. What a way to set the tone for the rest of the day !!! Thank you! Great class! Loved everything about it and learned some new techniques. Playlist was awesome too! Thank you! Yes! Ease into it sister. LOL I’m sure he just loves it! 😉 Have an amazing weekend girl! Great Workout! Cat, you are a wonderful teacher and awesome motivator!!Thanks! Great ride. Zone ride means anything but “Zone Out”. This was tough in a different way than going full out. Thanks Cat! I LOVED this class!!! Sometimes my mind gets the best of me, but focusing on maintain the zone was so helpful. I loved the sculpt too! We all overthink sometimes – you’re not the only one! Glad you thought so Holly! Great workout – and helpful to think about the zones and how we can influence them. Nice way to wake up this morning! Love ist ! Great ride and great music! NYOC2019 – Good workout thanks Cat! This was such a great workout! So we’ll put together-and the bonus sculpt was perfect! Thank you Kat! Nice Karen! Stay in the zone! Wow! Great class Cat. Super challenging to stay in the zones, but it worked great! Your instruction was right on target. I burned more calories in those 60 minutes than I do in an intense 60 min spin/sculpt! Definitely plan to add this one weekly. Thanks! Awesome class Cat! The perfect challenge. That was so different and deceptively challenging. Loved the 15 min. Sculpt after the ride. Nice. As one of the “older adults” these rides help me learn my body and not be so hard on myself if I can’t get up to speed as quickly as you can, but I get there! Hehe it always is! 😉 I know you do Jan, but everyone has their own speed & I’m so happy to hear you’re listening to your body! right to favorites! great way to learn control. Right!? It’s all about control! I try 🙂 Thanks Andrew! Glad you liked it! Go in and manually adjust your minutes if you need to. It’s easy. You’ll see how. Great job! LOVED this one, flew right by👍 thanks cat! NYOC2019 day 4! That was an amazing zone ride! It was sneakily challenging!! Loved it! Took this one to the treadmill. I absolutely loved it! It was so easy to adapt for the treadmill and you showed me that i can go a bit faster and still keep my effort and heart rate in a manageable zone. The sculpt was a nice surprise and i always appreciate a good stretch at the end! Thanks, Cat! That’s awesome Marie! Glad you tried something new and stay in that zone girl! This was way harder than I anticipated! But an extremely awesome class! As always, Cat keeps it fresh and sweaty! Incredible class…thank you so much Cat for teaching us about our bodies…i learnt so much and felt all the zones.. I’m definitely stronger than I thought.Looking forward to repeating this. In the zone! Awesome ride…really like the build up and the sculpt at the end! Thank you, Cat! Stay in that zone girl! Glad to hear it Kelly! We’re always here for you! MM2019-Love this class. It’s a nice reminder of knowing your body and working in those zones! Nice lift session too! Energy in da house! We kick off with a little techno to prepare your body for what’s next. Then rock kicks in and the volume pumps you up. Killer intervals begin and the heart rate spikes, then drops repeatedly. You’re feeling insanely strong. The finish… Bringing it back on beat with some fast paced climbs where your legs pump in sync to the beat of a song that makes you want to hit the club and rock that body! Can ya git it? This virtual 50 minute Spin class is gonna fly by with an all Rok-N playlist and tag team effort with two of SSoD’s most popular instructors, AJ & Mere (a.k.a. “W”)! This one has it all – flats, hills, intervals, jumps, and more. Plus, a test towards the end where you’re gonna climb, surge, sprint, then repeat. Yes, it’s designed to challenge you, but you can handle it. So hit play and get ready to ROKnRIDE! On the menu: Intensity, strength, endurance, drive, power packed into a 35 minute SpeedSpin®. Hit that bike and sprint right out of the gate. Next move into intervals, core work, jumps & heavy climbs. Its got it all! The pace is fast and furious and will keep your heart pumping and the sweat dripping. Git it! Cycling workouts are really like lifting weights. Depending on which muscle groups are being used, the intensity of effort and amount of weight lifted varies. If we are improving our steep climbing, we want high gear and slow cadence. If improving speed is the goal, low gear and fast RPM. 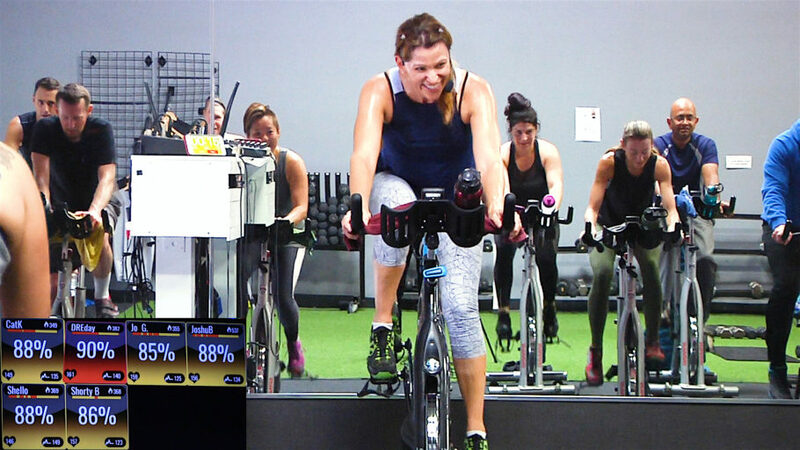 This amazing Spinning class blends a series of sprint breakaways with intense power climbing in an effort to “Mr. (or Mrs.) Universe” sculpt our legs!